This is a peaceful spot and I always like coming here. I never cease to be amazed at how this modest location that was so important in the history of England is so under-visited. King Alfred defeated the Vikings at the crucial Battle of Ethandune (likely to have been at Edington in Wiltshire) in 878. The Vikings fled to their fortress, which seems to have been at Chippenham, where they then surrendered. The Anglo-Saxon Chronicles tell us that three weeks after the Vikings surrendered, Guthrum came with thirty of his men to be baptised into Christianity at a place near Athelney called Aller. Asser tells us that Alfred himself raised Guthrum from the baptismal font and that Guthrum became Alfred’s adopted son. St Andrew’s church at Aller, like Athelney, is on raised ground in the Somerset Levels, suggesting that the church probably would also have been on an island in Alfred’s time. The oldest parts of the current church are 12th century, so the events of 878 must have taken place at a preceding structure. 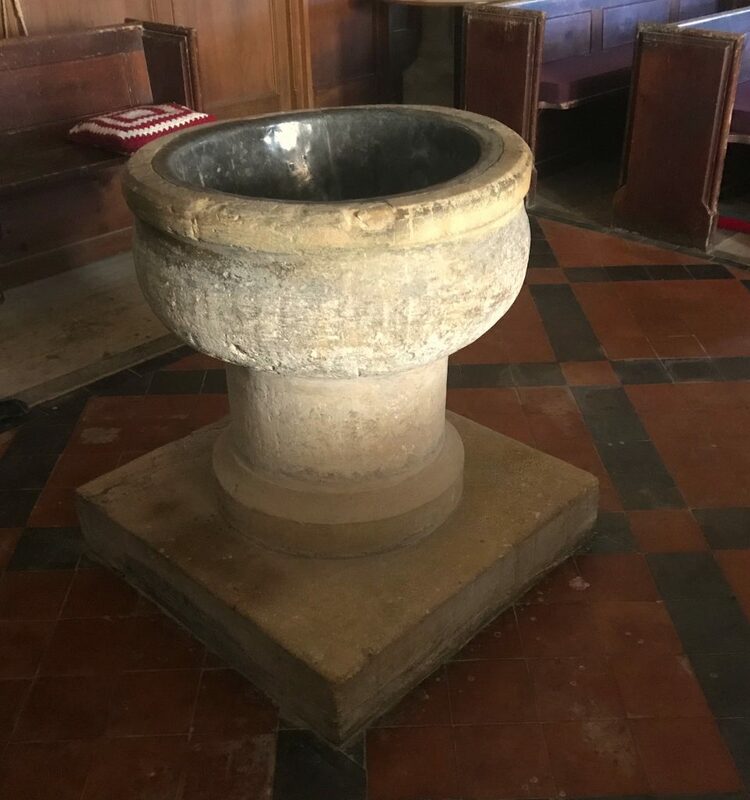 It has been claimed that a font in the church (the more bowl-shaped of the two fonts), recovered from the rectory pond in the nineteenth century, was the one used to Baptise Guthrum. The church can be tricky to find. 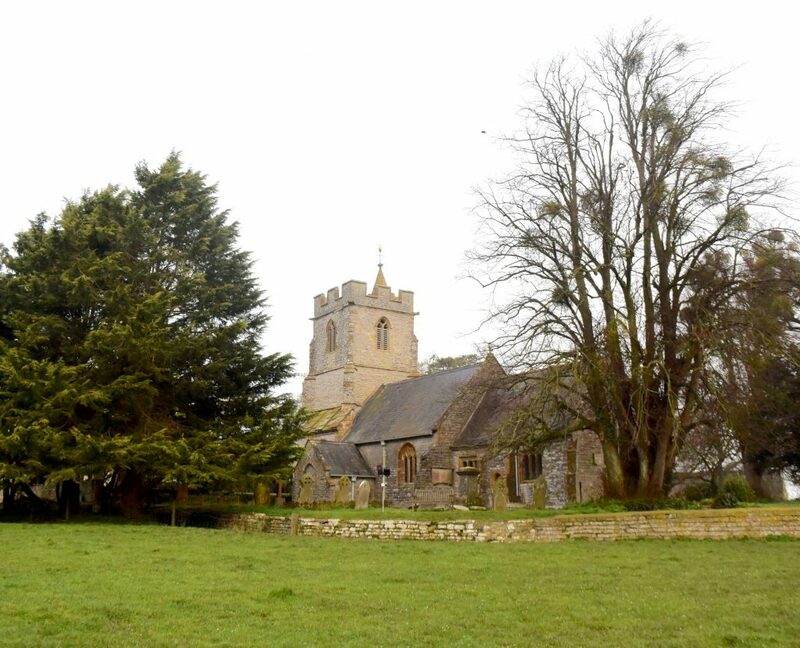 Coming from Langport direction, it is necessary to take a left turn onto the road called Church Path and then turn left where there is a wooden sign for the church. The church also has a small but beautiful King Alfred Window, which is a memorial to the two reigns of King Alfred and Queen Victoria. 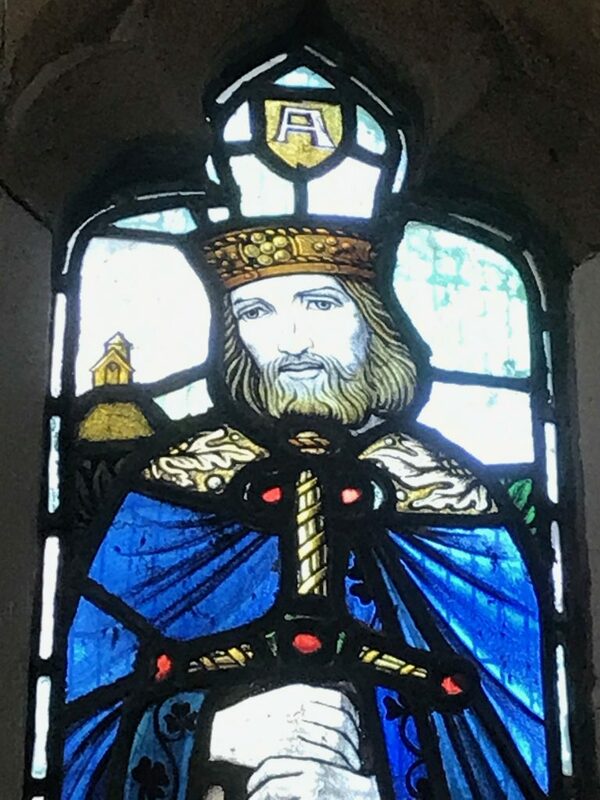 The King Alfred window at St Andrew’s church, Aller. It can be speculated as to why Aller, about fifty miles distant from Chippenham, was chosen as the location instead of somewhere closer. 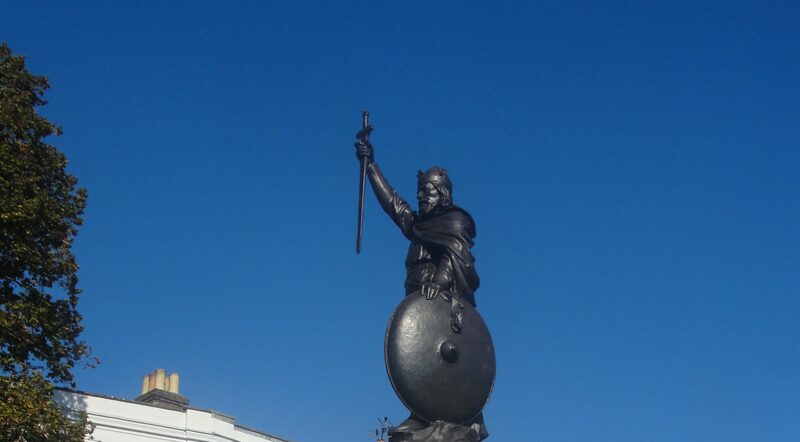 Perhaps Alfred did not trust Guthrum and this was deemed to be a safer location, or perhaps Aller was a more significant place then than it seems to us today. It might even be that Alfred knew Aller well if he came here to pray when he had his base at nearby Athelney. Aller is only a few miles north-west of Langport, which must have been a significant place in Alfred’s time as it is included in the Burghal Hidage (a list of defended locations), drawn up under his son, King Edward the Elder. Although there is nothing that I could find to specifically connect King Alfred with Langport, it seems likely that he would have been there at some point.